A new concept in high rise accommodation. We include nudge features to improve the lives of the residents. Unfortunately modern city lifestyles are making us sick and unhappy. We tend to eat unhealthy foods and do the minimum of exercise. We are also becoming more lonely and self centred because superficial friendships on social media such as Facebook are replacing traditional face to face friendships. But it does not need to be this way. Planners could re-design housing accommodation so that people are gently nudged back into healthier, happier community lives. This article concentrates specifically on high rise flat living because it is tragically of current interest to city planners. Figure 1. Growing tubs of plants on the patios will create a hanging gardenseffect. Adding the farm helps to to create a self sufficient community spirit. The new 'Hanging Garden' designs will be more expensive to build and run compared with conventional tower blocks. But the development of Latent Power Turbines could slash these costs. In general, the cost of building materials will fall because the cost of the energy required for manufacturing glass, steel, concrete, bricks etc., will fall. The energy cost of artificially creating summer intensity lighting and temperatures indoors, in cool northern winters will fall. Likewise, the cost of cooling buildings in hot climates will fall. 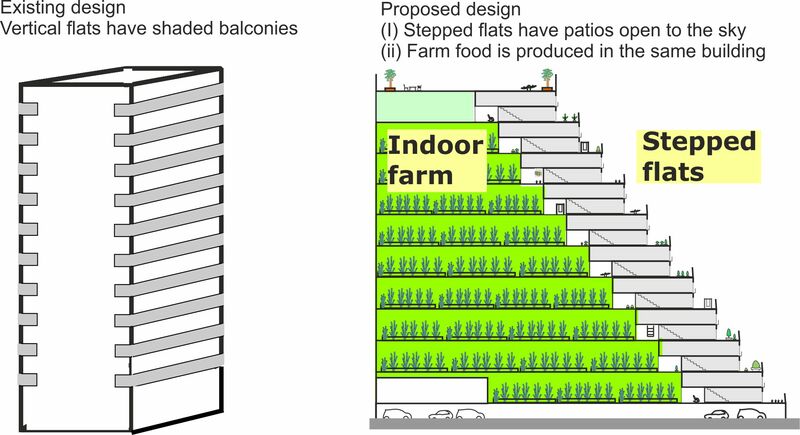 The diagram below illustrates the basic feature of a combined high rise dwelling building and vertical farm. 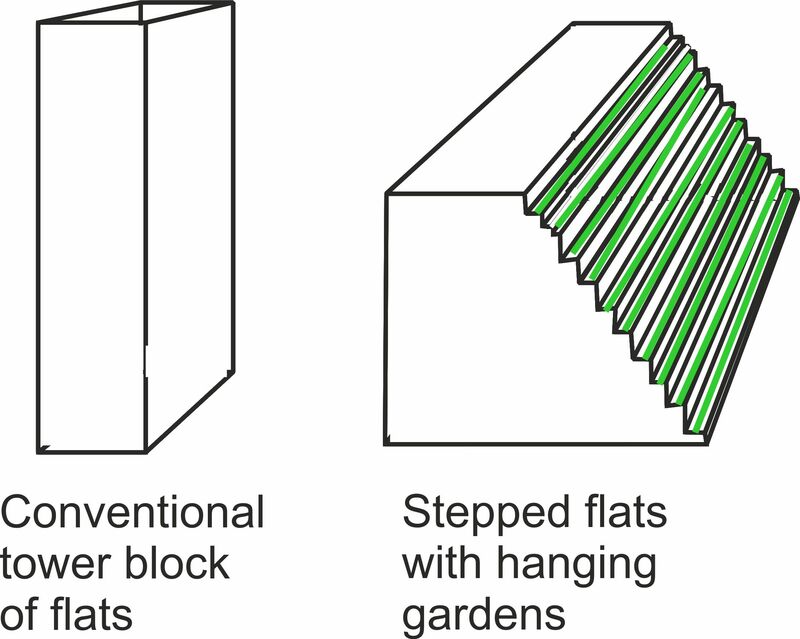 Figure 2.The long 'street' design allows all the 'Hanging Garden' residences to have south facing patios. A key feature of indoor farming is that it can provide a steady output of crops throughout the year. This is less financially stressful and more dignified for farm workers (who will hopefully be residents), compared with seasonal farm work. 'Nudges' are subtle features of the design that help people to live healthier lives without having to make a conscious effort. The two story residences oblige residents to do informal exercise by walking up and down stairs. 'Long streets' of 20+ residences encourage people to do more walking and create more opportunities for social encounters with other residents. Easy access to cheap, fresh local fruit and vegetables encourages healthy eating. Ready washed farm food could be sold by the farm shop in small quantities and without packaging. This would encourage daily shopping routines where residents make frequent encounters with other residents. South facing patios would encourage exposure to sunlight and and the buildup of vitamin D.
Internal air would be filtered and sterilised to reduce the transmission of airborne infections. Pollen from the farm and indoor gardens could also be filtered out. 2 Additional features to improve community life. Hanging garden settlements could reduce death rates at both temperature extremes. We will illustrate the benefits by referring to cool climate living, but equivalent benefits can be gained in hot climates. Seasonal affective disorder (SAD) is a type of depression that comes on during the darker days of winter. SAD can trigger alcohol, eating disorder and other health problems. We propose taking advantage of the recently developed daylight quality LED lighting to bring Mediterranean quality outdoor lighting to indoor living in cool northern climates. The diagram below shows some of the nudge features that help to create community bonds. Figure 3. Mediterranean quality indoor light will lift the spirits in winter, but genuine outdoor light is even better. Low cost clean energy will allow very large south facing windows to be installed without increasing carbon footprints. In addition to patios, shallow balconies could be added to the upper levels. To prevent children from raiding the farm, it would be separated from the street by a robust but attractively shaped fence that doubled up as a street long climbing frame. Smart drop-down mesh screens could protect cherished indoor gardens when energetic kids start playing ball games. The streets would be slightly winding with seated alcoves extending into the farm. Each 'street level' would develop its own character. 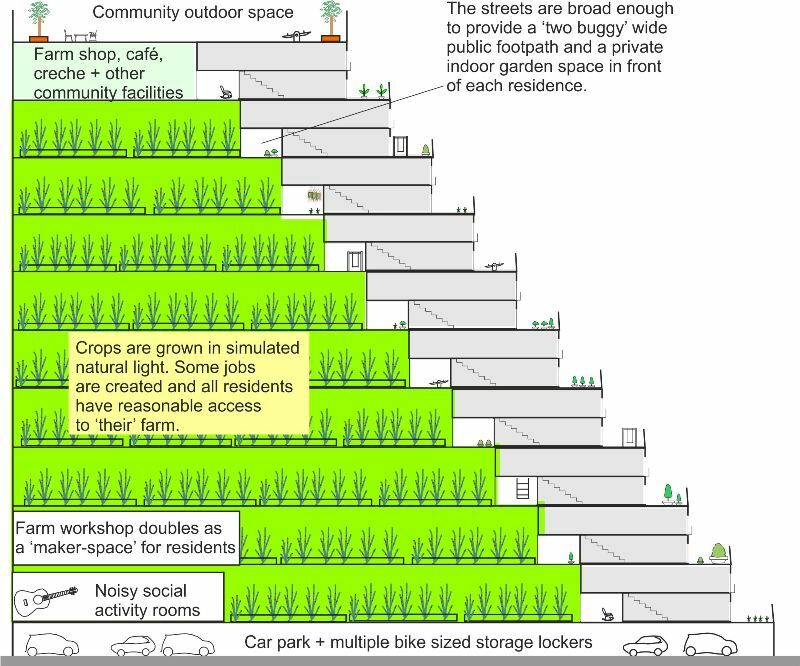 To enhance these differences, the farm would grow different crops at different street levels. The variety of indoor gardens would encourage residents to take strolls around their residential building. This would promote social encounters and reinforce the community identity. The occasional front doorstep equivalent to a car boot sale would also encourage residents to roam around the whole of their residential building. The farm repair shop could double-up as a ‘makerspace’ for use by hobbyists and micro-businesses. Equipment could include sewing machines, lathes, work benches, potter's wheels, kilns etc. Residents may chose to use their indoor 'garden' space to develop their own low risk micro-businesses, for example hair dressing, altering clothes or selling their own baking, artworks, plants and pottery. Takeaway food services that incorporated ingredients from the community farm would encourage healthy eatuing. Some would go on to develop larger businesses in external premises. These local businesses would counter the anonymity of the big name businesses. In order to prevent such micro-businesses being exploited as tax free havens, they would need to be VAT registered and provide all customers with a receipt. In order to promote business honesty, each community should be entitled to claim a 50% rebate from the VAT authorities for reinvestment in their settlement. For example, the VAT refund could be used to subsidise the cost of fresh food sold by the farm shop with additional subsidies being offered to residents who bulk purchased food for cooking, for sale to other residents. The services offered by the micro-businesses could enhance their community in many ways. For example by ¨ converting first floor balconies into small conservatories, ¨adding pet proof fencing to patios, ¨ constructing compact and safe kids play furniture, ¨ making bespoke plant containers, ¨ installing air purifiers for micro food takeaway businesses. Pets are vital for the mental health of many people, but barking, street fouling dogs can be a nuisance. Residents could be obliged to attend dog training classes whenever they acquire a new dog. Expert advice on suitable dog breeds should also be available. Children would be encouraged to use the makerspace area, or better still, have their own makerspace. This would include the resources needed to develop adult living skills such as food preparation. The purchase of working materials could be subsidised using the community VAT rebate. This could create jobs for younger people while allowing elderly residents to remain within the community. Features such as the indoor street gardens where residents can sit 'outside' will make monitoring of the elderly and infirm easier. In order to minimise adaption costs, the marionettes should be designed with the transition into old age in mind. For example anchor points for stair rails and chair lifts should be interchangeable and downstairs storerooms positioned for easy conversion into toilets. The capital cost of these community buildings will be higher than for traditional high rise flats. But over their lifetimes the health and social benefits of creating genuine communities will outweigh this. On the other hand, stepped flats would allow a far higher population density than traditional two story dwellings, so land purchase costs would be lower. Service men and women lose the community bonds of their service life when they retire, with many ending up mentally ill and homeless [https://www.mirror.co.uk/news/uk-news/least-13000-hero-soldiers-left-11847000] Finding new homes in hanging garden settlements would help them to adapt to civilian life. Fire safety standards will be higher than for conventional high rise flats because fire fighting crews and their hoses will be able to gain patio access to all stories. 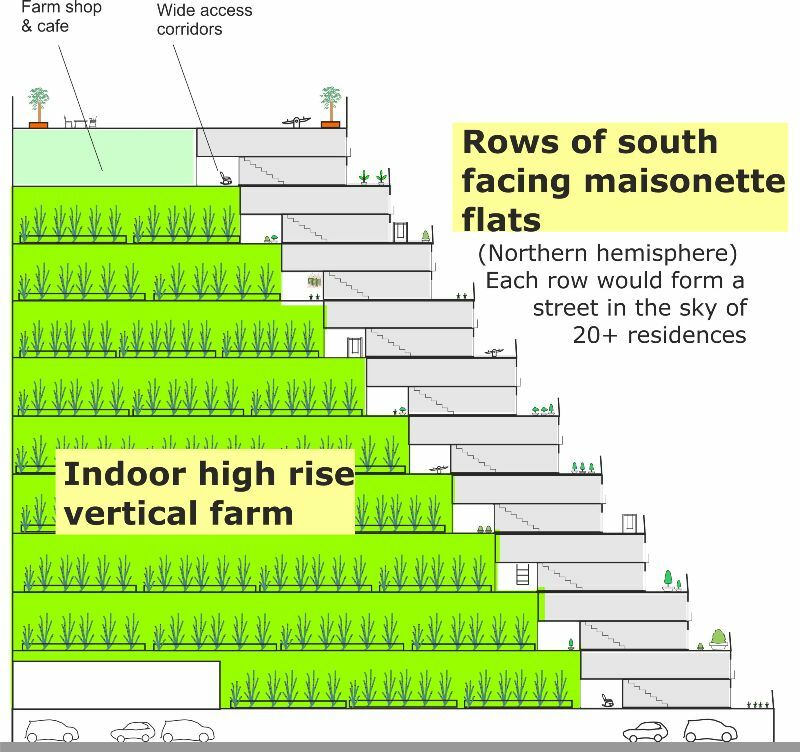 The design would offer several evacuation routes via the vertical farm unit. The escape routes would double up as walkways, allowing residents to take leisure walks. The installation of sprinklers will be more cost effective because they will be needed for everyday use at each level, for horticultural irrigation. The north facing vertical farm also provides cladding free insulation for the coldest face of the building. Retracting mesh screens would prevent the adjacent crops from being interfered with by kids. The dense meshes would also provide barrier protection against white-fly and other disease carrying insects, thus reducing the need for insecticides and fungicides. Once you get to the fourth floor or higher in a building, the chances of you dying in a fall from a balcony or window onto hard ground are high. So, compared with conventional high rise flats, stepped flats should offer a far lower risk of both accidental and deliberate death by falling. Short ridged roofs over first floor balconies and rain protection canopies over patios would cushion falls, further reducing risks. The canopies could be mounted on friction brackets that allow the canopy to move down (say) 20 cm if somebody falls on them, absorbing impact energy. Canopies would also give a degree of privacy to scantily clad patio sunbathers. Families with active kids could also enclose their patios in mesh cages (similar to cricketing nets), allowing the kids to play outdoor ball games in safety. Variations on the 'Hanging Gardens' theme. A whole range of alternatives could replace the vertical farms. These could include light manufacturing industries, libraries, schools, university campuses and science research laboratories. 'Living on the job' will cut commuting times and reduce the density of traffic on city roads. Open prisons that incorporate hanging garden features could help to shift prisoners nearing the end of their sentences from an institutionalised to a mutually supporting community mindset.